It has recently occurred (or perhaps re-occurred) to me that people have varying definitions of what they consider "concealed carry". I was called out recently on one of my blog posts by a reader who stated, "So a Glock 34 is considered concealed carry now?" My knee-jerk internal response was a very loud "If it's concealed it is! ", but this got me thinking. A lot of people think that a small pistol or pocket gun on your person automatically equals concealed carry, and that you can't carry a big pistol concealed. Your body shape and mode of dress has much more to do with whether the pistol you're toting around is concealed than does the actual size of the pistol, but the bottom line is—your pistol is either concealed, or it isn't. Period. I know a professional shooter who does a lot of tactical training who, just to prove a point, went shopping at the mall one winter afternoon. Under his coat he was wearing his full race rig, i.e. a high-cap 1911 in a speed holster and 4 high cap mags. He is skinny, and wearing a bulky winter coat his gear simply disappeared. If you want to carry anything larger than a pocket gun, no matter your size or shape, to some extent you will have to dress around your gun. I am tall and relatively slender, and in the summer months tend toward Hawaiian shirts unbuttoned in the front. So attired I could successfully conceal a sawed-off shotgun under each arm. As a general rule, patterned fabric conceals bulges better than solid colors. Hiding a full-size auto pistol on my hip is no problem, as long as I stay aware of two things—an errant breeze can always blow my shirt open, and if I bend at the waist, I'll print. If you carry on your hip, and don't know how much you print when you bend over, find a mirror. You'll be shocked. If you are fat and bulge out over your belt in all directions, you immediately suffer a handicap when it comes to trying to conceal anything on your person. 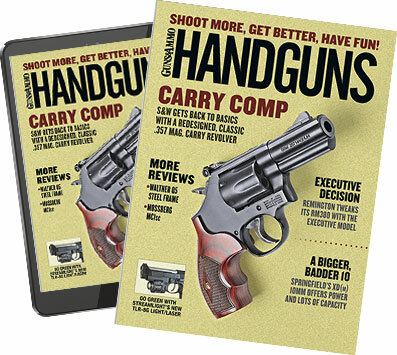 It may take a little more work for you to figure out where and how to carry, but it is possible for everyone to carry concealed (if they so choose) something larger than a pocket gun. Something the size of a Glock 19 in an inside the waistband holster, either strong-side hip or appendix carry, will disappear for most people under nothing more than an untucked shirt, and no-one should feel "under-armed" carrying a pistol that "only" holds 15+1 rounds of 9mm. You may not have the option of carrying a gun at your waist, so for many people, concealed carry equals a pocket gun, but just because the gun is in your pocket doesn't mean it is out of sight, or concealed. Pocket guns print, and depending on how your jeans/khakis/dress/tacticool pants fit, sometimes pocket guns print BAD. Stick your pocket gun in your pocket and stand in front of a mirror. If it passes that concealability test, sit down in a chair—you'll be surprised how tight that fabric suddenly becomes around that pistol with some pants. You'll also find out whether your pocket will dump your pistol out on the floor. If you've been carrying a pocket gun and haven't tried this already, shame on you. The tighter the pocket, generally the more the pistol will print and the harder it will be to get it out quickly. Just because autos are flatter than revolvers doesn't mean their shape is any less identifiable. I recommend pocket holsters for two reasons—they conceal the shape of the pistol in the pocket, and keep the pistol oriented in the proper direction. Remember, it's either concealed, or it's not, and just because you're carrying a smaller pistol doesn't automatically make it invisible.